One of the many questions that has been asked by those who are not tithe-giving members of the Church of Lucasfilm over the last year or two (and quite loudly, by some) about this film is “Do we really NEED a Han Solo stand-alone movie?” Well, the honest answer to that is No, but it’s also an honest answer to the question “Do we really ever need ANY movie?” We didn’t know we NEEDED Star Wars in the first place until His Lucas-ness gave it to us. Lots of things in life that give us joy are things we never sought in the first place, but we couldn’t imagine life without them once fate dropped them in our laps. 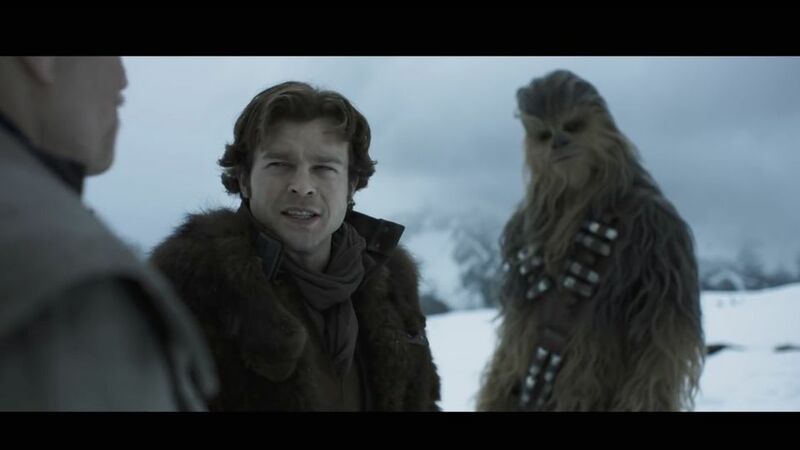 So regardless of any question of "need," we now have it - Solo: A Star Wars Story. Fired directors, Oscar-winner replacement director, that dragon-lady chick from “Game of Thrones,” an actor who doesn’t look like Harrison Ford, no Jedi Knights, no lightsabers, no Darth Vader… Geez, how in the hell can this possibly work??? Lemme, tell ya, folks - it DOES work in being exactly what it needs to be. You may wish it were something more, but if that's the case, then it's on you, not this movie. Ron Howard, the first Oscar-winning director to helm a Star Wars film, has made a movie that meets the first requirement of any summer blockbuster-with-popcorn flick - it’s FUN. Does it answer any great mysteries about the character of Han Solo? Well, no, but since there was never much “mystery” to the character, anyway, who cares? Yes, we knew the generalities about a lot of these events, but screenwriters Lawrence and Jon Kasdan have crafted a tale that shows us the nitty-gritty of how he entered the criminal underworld of that far-far-away galaxy, how he met the other characters we associate with him, and how he came to own that funny-looking spaceship. Of course, we know Lawrence Kasdan as the guy who wrote Empire Strikes Back, Return of the Jedi and The Force Awakens, so if he says his is how Han’s life went down, then by Golly, I’ll take his word for it. Whatever its shortcomings may be (and we’ll get to those), this film does the one thing lots of fans have been clamoring about for some time now - it gets around to showing us that there’s more going on in the galaxy than just the damn Death Star being built/rebuilt. Ron Howard shows us lots of new characters that flesh out our knowledge of the Star Wars universe, some only in passing, and I like the director’s choices in how he chose which to bring to the forefront and which to leave as window-dressing. We see Han enlisting in the Navy to escape Corellia, only to be kicked out and sent down to the infantry. 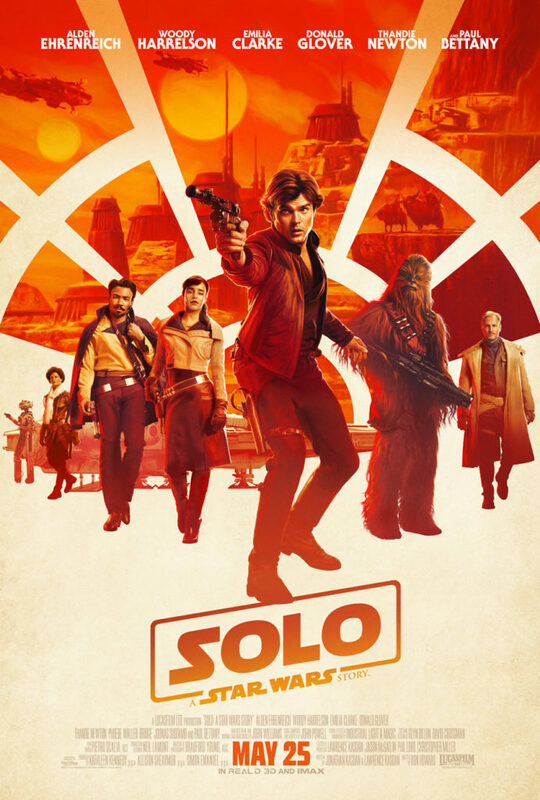 He deserts and falls in with a gang of thieves led by Woody Harrelson’s Tobias Beckett, who spends lots of time stressing how important it is that Han not trust anyone. Han also meets Chewbacca (of course), meets Lando (played by a scene-stealing Donald Glover) and begins his life as (as he puts it) an “outlaw.” Speeder chases and train robberies and bar fights abound, and no, I’m not getting it confused with some generic Western. 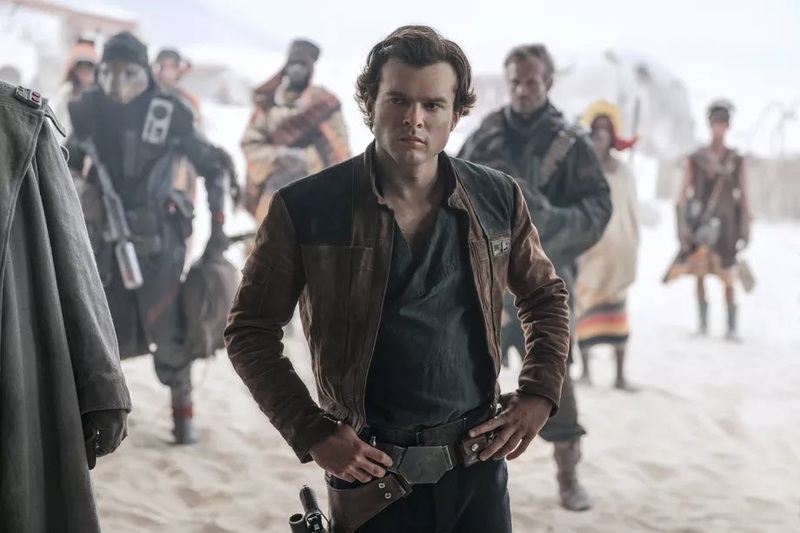 Okay, I can hear many of you saying it - Alden Ehrenreich doesn’t look exactly like Harrison Ford. Again, so what? Ehrenreich does a fine job of conveying the fake-it-til-you-make-it swagger we have come to know and love from the character of Han Solo, and does it with the slightly larger quantity of boyish charm this particular story requires. He’s a fine actor and does a great job with portraying this character at this stage in his life, something the near 80-year old Ford couldn’t possibly do (well, not without some of that Michael Douglas/Ant-Man magic, anyway). The entire cast is terrific, and that includes Emilia Clarke, who gives what I think is her best non-"Game of Thrones" performance yet as Han’s boyhood love, Qi’ra. My only true complaint about the film is Bradford Young’s cinematography. If my experience had only happened in one theater, I’d write off the problem to minimum-wage theater workers not taking more pride in their work, but I’ve seen the film twice, in two different theaters, and both showings were entirely too dark. Footage I’ve seen in the promotional materials on television seem much brighter, however, so I’m not sure what’s going in in Lucasfilm’s color-correction process or what Disney’s marketing team is doing to brighten things up. Maybe the home video print(s) will be better, but we’ll have to wait a few months to see. Look, if you love Star Wars (as I do), you’ll be more inclined to truly love Solo. As with any beloved property, there are those out there who will take pot-shots at it merely because “it ain’t what it used to be” (or some other similar snide assessment), but those people are very sad and empty and have no joy in their souls, and make themselves feel better by tearing down what brings happiness to others. Of course, I’m not a psychotherapist, and I don’t even play one on TV, so my diagnosis may not be entirely accurate, but you get my drift. I personally really, really liked it, but I won’t go so far as to say I loved it. It was a well-made, fun adventure story, one that fits into the Star Wars mythos very well, and I don’t really feel that I should ask more of it that that.